Triangular weirs are sharp crested thin plates with V – shape opening (or notch). These plates are designed to measure seepage water flows in channels or tanks. Triangular weirs are sharp crested thin plates with V-shaped opening (or notch). These plates are installed at the exit of a channel, tank, or basin in order to measure the real-time flow of water. For a given weir profile size and shape, the flow of water is related to the head of water at the weir. 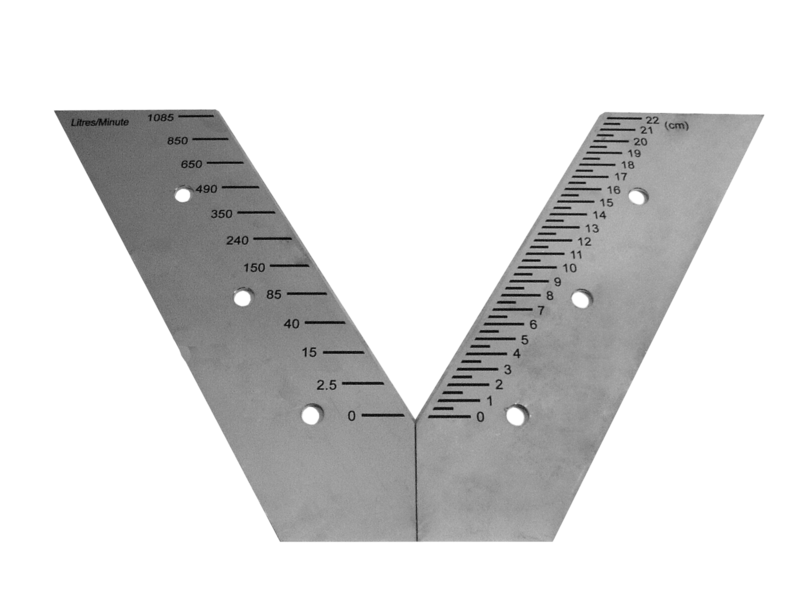 Measurement can be carried out manually directly on the plate or on a staff gauge fixed to the basin wall, or remotely via a water level sensor installed in the basin at a minimum distance of the V-notch. Acoustic or vibrating wire NIVOLIC WL sensors can be used – see separate brochure for more information. A typical application for these plates consists in measuring the flow of water on the downstream side of a dam. The seepage water flow will be diverted to an open channel in a weir-station. Seepage measurement is one of the most important indicator of the overall performance of earth / rock – fill and concrete dams.